I’ve always loved letters, both sending and receiving them. And in the age of email overload, I appreciate letters even more. It just feels more personal when someone takes the time to handwrite a note and find a mailbox to drop it into. So a new website called Lettrs immediately intrigued me. Lettrs, which officially launched last month, tries to mimic the analog letter-sending process. It lets you send personalized, digital notes on artful stationery to recipients via their email or social networks. You can tag the letters with keywords so they’re searchable later on, and Lettrs will send you an email notification when a letter has been delivered. The concept of Lettrs is intriguing. And right now, its services are free. But just as you might not use Evite to send a wedding invitation, I wouldn’t use Lettrs to send, say, a sympathy note to someone. I also wouldn’t use it to make plans for the near future. I tried planning a group dinner using Lettrs, and no one responded, though friends did respond to emails about the same dinner outing. 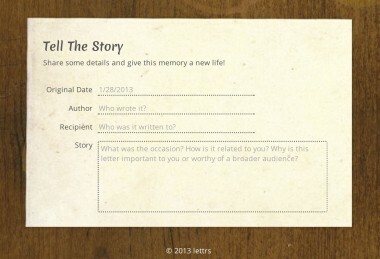 There’s also something that feels distinctly low-tech about Lettrs. Currently, there aren’t any mobile apps, which made letter-preserving more complicated. And I encountered some errors in key parts of the letter-sending process. 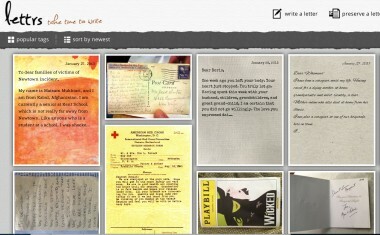 The main page of the site is littered with interesting public-facing letters that members of the Lettrs community have written. For example, there were letters addressed to President Obama on Inauguration Day. Someone wrote a letter to the flu, personifying the illness and saying she didn’t like it very much. Another person wrote a letter to Apple, Inc. These Lettrs can be tagged and made searchable. 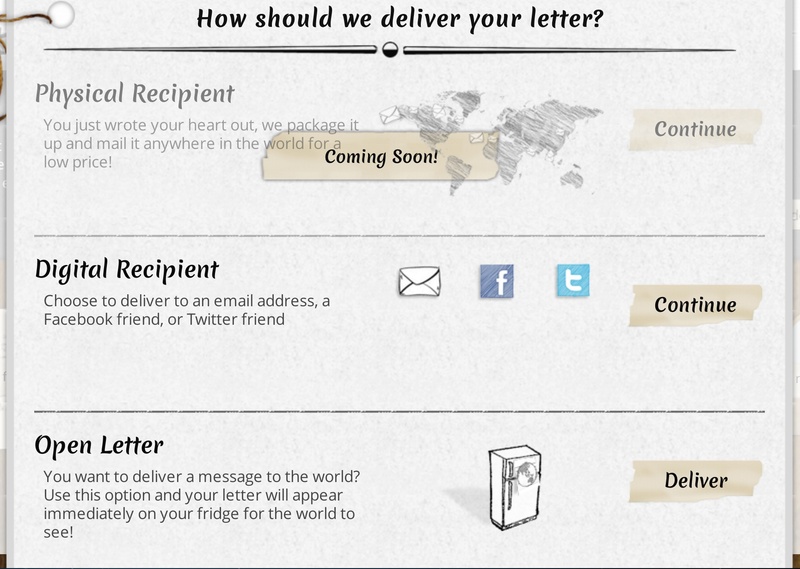 In the upper-right-hand corner of the page, there are options to write a letter, preserve a letter and explore various virtual places in your own account, whether it’s your kitchen counter (where you receive letters), your shoebox (where you store private letters), or your fridge (where you post letters to the public). Lettr-writing was easy. I had the option to choose from 21 different Lettr designs, which ranged from modern to classic to playful to romantic. The text styles vary, too. Some look more like natural handwriting, others look like calligraphy. You can deliver a Lettr using a person’s email, Facebook or Twitter name, or you can just post a public letter to the Lettrs website. 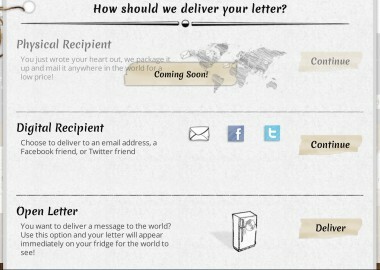 Lettrs also plans to introduce physical letter-sending as an option in the spring. This might bring to mind apps like Postagram and Apple’s Cards service, which allow mobile phone users to send physical cards from an app on their smartphones. These range from $3 to $5 per card; Lettrs plans to charge anywhere from $1 to $1,000 for its service. In total, I delivered more than a dozen digital Lettrs this week. I never got a response from anyone. It’s entirely possible that some friends and colleagues just don’t like me, but I’m pretty certain that’s not the case here. I believe the lack of response was due to the fact that many ignored the Lettrs notification in their inboxes, or they didn’t understand that they had to sign up to read my Lettr first. Some of them saw the notifications, but balked at signing up. Also, if a recipient signed up for a Lettrs account using a different email address than the one I sent the Lettr to, they couldn’t see the Lettr. So when I sent notes to co-workers using their work email addresses, if they opted to log in using their personal emails, they wouldn’t get my Lettr. 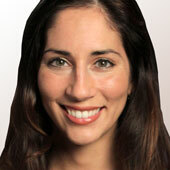 Lettrs creator Drew Bartkiewicz says the company is working on creating an identity for each user, like a digital P.O. box, that includes all of their email addresses to ensure that users get their Lettrs. Also, I experienced some bugs when I tried sending a Lettr via social networks. Even after I connected Lettrs to my Facebook account, it kept telling me I wasn’t connected. When I tried to send a Lettr to my co-worker using his Twitter handle, I encountered an error there, too. Bartkiewicz says the company’s tech team is currently looking into the glitch. But, due to Lettrs’s lack of a mobile app, I couldn’t scan or snap photos of physical letters and send them directly to Lettrs. I had to take photos of the letters with my camera or phone, transfer the files over to my desktop and then upload them. The image-editing options could be better, too. Once I uploaded a letter sideways, for example, I couldn’t rotate it. I accidentally dated a Christmas card from my parents as “2012,” and later on couldn’t change it to the correct year without uploading the file all over again. However, once I shared my preserved love letters, Christmas cards and Broadway Playbills with the Lettrs community, I began to get comments and feedback from other users, which was a nice touch. 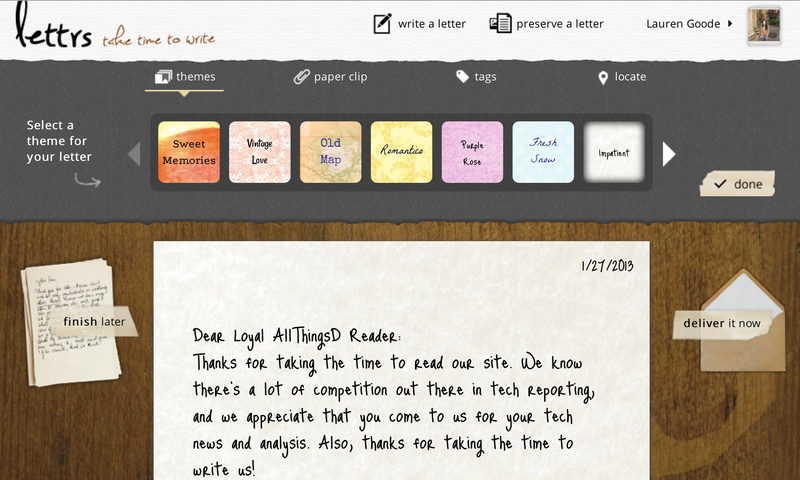 The whole Lettrs experience would be much better with mobile applications. That way, users could read and write letters from mobile, in addition to preserving physical letters more easily. Fortunately, Lettrs says a mobile app is coming in the spring, along with more template designs and virtual fridge magnets. 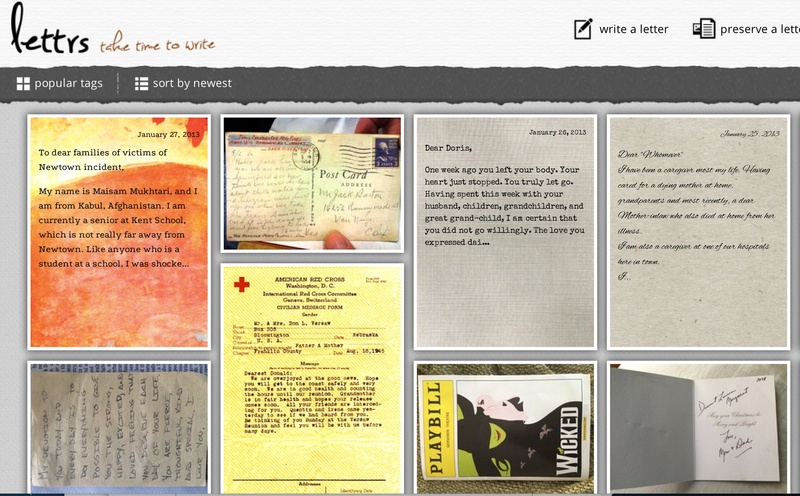 I wouldn’t write off Lettrs, and I enjoyed using it for the most part, but for now, it’s still a website in progress.